A well-known Armenian human rights activist remains in hospital, suffering wounds inflicted when he was attacked Tuesday morning in Yerevan. Mikael Danielyan, 45, Chairman of the Armenian Office of Vienna based Helsinki Association was attacked by four unknown men outside his home on Papazyan Street, while walking his dog. His assailants attacked Danielyan from behind, knocked him down, then kicked him until he lost consciousness. The physician says Danielyan did not suffer a concussion, however his blood pressure is dangerously high and doctors say such a shock could provoke a stroke. The Yerevan police has launched a criminal proceeding on the case, however so far there are no suspected. Detectives spoke with Danielyan on Thursday. Danielyan, one of the most active human rights defenders in Armenia believes that the attack was planned and organized by authorities in response to his criticism of human rights abuse in Armenia at the hands of officials. He qualified the violence against him as “state terror” and says that the authorities intended to frighten him. While Danielyan says it is still unclear for him what exactly of his activity, recent publications or statements might provoke the attack, the local media community gave the following versions of the attack trigger. Some say the attack on Danielyan was the aftermath of his recent remarks to the Azerbaijani newspaper “Echo”, where he criticized President Robert Kocharyan and the Minister of Defense Serzh Sargsyan for their efforts to stop the opposition movement which has intensified in recent weeks. Some journalists speculate that the attack was organized by authorities to at least temporarily suspend Danielyan from his human rights activity in the period when the authorities will start mass arrests of opposition activists. Several members of the oppositional parties have already been arrested following the disorder at rallies in Gyumri last week. Danielyan does not rule out the possibility that the beating was meant to silence him. Danielyan’s wife Anna Hakobyan says she is convinced that her husband’s activity disturbs authorities and he was beaten for his criticism of the authorities human rights records. “I foresaw that something like that could happen,” says Hakobyan, the head of the Armenian office of London based PEN organization for writers. 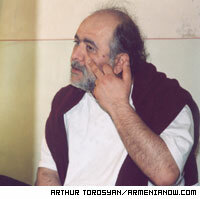 Hakobyan recalled the 2002 attack on journalist Mark Grigoryan who was seriously injured by a pipe bomb. Some say the attack was in response to articles Grigoryan wrote that were not pro-government. 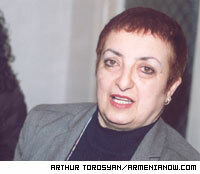 No arrests were made in the incident and Grigoryan has since moved abroad. President Kocharyan commissioned the General Prosecutor to study the circumstances of the incident and undertake all possible steps to reveal the guilty.